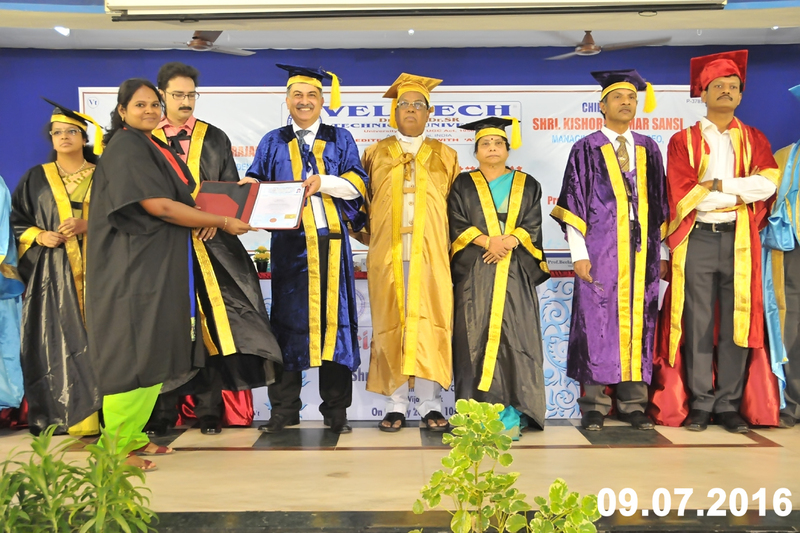 The University conducted its Special Convocation on July 9th 2016 at the University Campus. A grand function honouring the B. Tech 3rd year, final year and Alumni students. Shri. 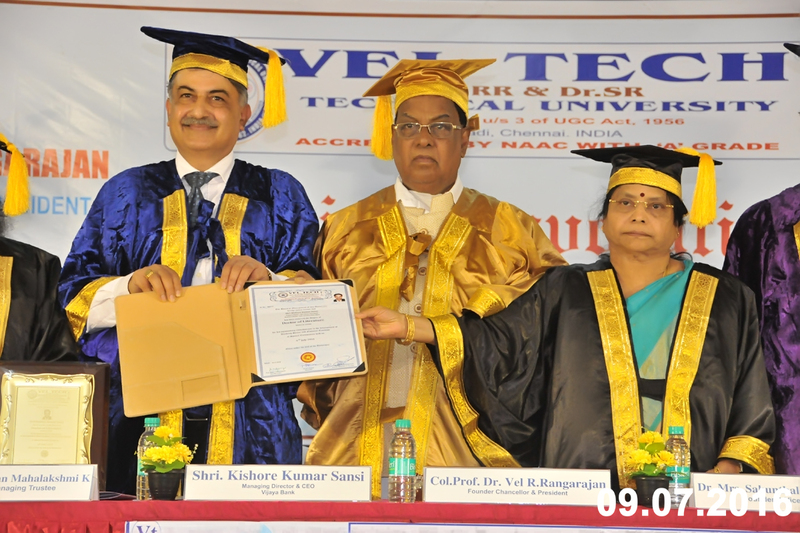 Kishore Kumar Sansi the Managing Director & CEO of Vijaya Bank, distributed the awards in the presence of Col. Prof Dr. Vel R. Rangarajan, Founder Chancellor &President , Vice Chancellor Dr.BeelaSatyanarayana and Pro- Vice Chancellor Dr U. Chandrasekhar. Foundress President Dr.Sakunthala Rangarajan, Chairperson Managing Trustee Mrs. R. Mahalakshmi Kishore & Vice- President Mr. K.V.D. Kishore Kumar were also present. The four year scholarship will cover the cost of tuition fees and hostel accommodation which amounts up to a maximum of Rs. 2,10,000 per year. The University also conferred HonorisCausa, to Shri. 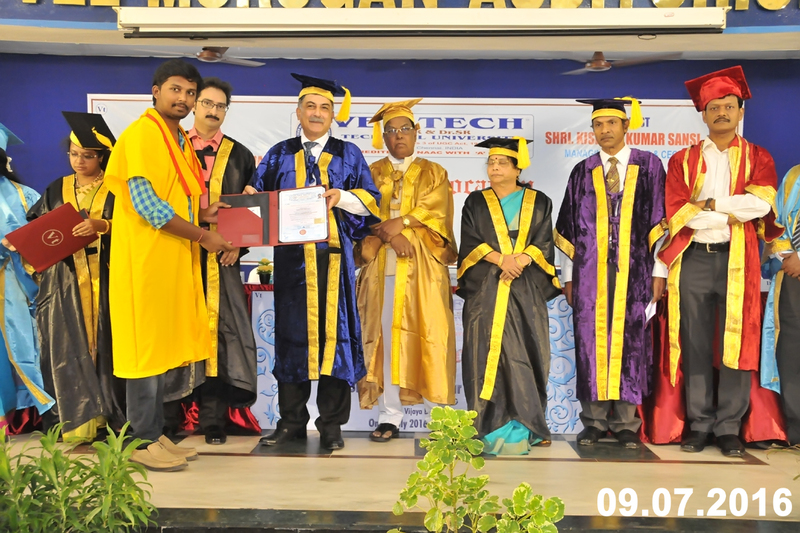 Kishore Kumar Sansi in Literature during the special convocation conducted on the same day. 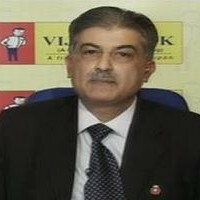 He is a technophile and a highly qualified and seasoned banker, who is currently holding charge as the Managing Director and CEO of Karnataka based Vijaya Bank. A Postgraduate in Physics from the University of Delhi, he is also an M. Tech (IT-Information Systems) from I.E.T.E, Delhi and an M. Phil. (Electronics), from the University of Delhi. Taking his interest in technology to the next level, he is also qualified as a Certified Information Systems Auditor (CISA) from ISACA, US. 5. Member of Working Group on Technology, Digital & Financial Inclusiong – Gyan Sangam 2016. 6. Chairman of the Gyansangam 2016 sub group on – Drive Cross Sell through analytics to increase average products per customer (PPC). Innovative Welfare scheme for Visually impaired schemes viz providing aids like smart walking canes, talking software, Braille attachements etc besides career advancement. One of the Bank’s unique feature of CSR activity is adopting a girl child belong to poor Socio-Economic back ground of the society. Bank has adopted 127 girl children during FY 16 and total adopted girl children so far is 196. Bank has established 32 Rural Health Centres where patients are provided primary healthcare and medicines free of cost. Shri Sansi showed exceptional leadership ability in articulating Short Term and Medium Term Vision for the Bank upto 2021 and actively initiated long-term programmes for creating world-class systems and frameworks for future growth of the Bank.